We are an AMI-certified Montessori school for children ages 2 months through 14 years. We're located in Mesa, Arizona, convenient to Tempe, Gilbert, Chandler and much of the East Valley and metropolitan Phoenix area. Montessori International School was founded in 1982 in Gilbert, originally opening as a primary school out on McQueen Road and Baseline. The school was extended the next year to the Gilbert Road address in Mesa where the office and two primary classes are currently housed. In 1984 MIS expanded further to include the Brown Road campus, where one primary and the elementary classes are now located. The school currently occupies the two campuses located on Gilbert Road and Brown Road, and a toddler community next to the Brown Road campus (opened in 2003). Montessori International School has grown from its first primary class to an infant community (ages 4 to 12 months), a toddler community (ages 12 months to 2 1/2 years), three primary (ages 2 1/2 to 6 years) classes, one lower elementary class, and one upper elementary class. Hundreds of children have grown and developed through MIS’s programs, and many now contribute as adults in the community. The MIS teaching staff is led by Therese Kestner, B.A., M.Ed, AMI certified and specializing in learning disabilities. She has taught and directed Montessori schools for the past 40 years. We are delighted to bring these facilities to life each day with the personalities of our staff, our students, and the many others that combine to make up the Montessori International School community. The toddler, primary and lower elementary classes at MIS are affiliated with the Association Montessori International (AMI). This training and accreditation organization was founded by Dr. Maria Montessori herself in 1929. The teachers in these classes have finished the AMI training for their specific age groups, and participate in ongoing teacher education in the form of conferences, refresher courses, and meetings with other AMI teachers in the area. The teachers in the middle and upper elementary classes have met the requirements for the Arizona State teaching credential. They also participate in ongoing education. Montessori International School is licensed by the Arizona State Health Department. blah blah blahblah blah. blahblah blahblah blah blah. blah blah blah blah. Our classrooms are places where children are given the opportunity to achieve academic and personal success. The goal in these environments is to encourage the development of a love for learning in each child. 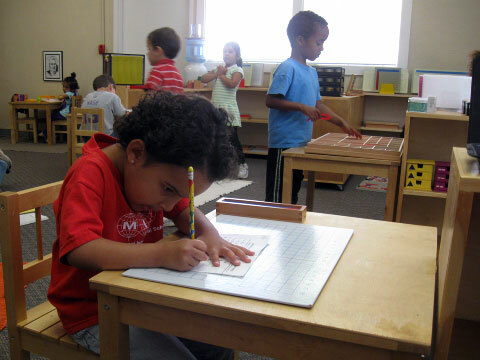 The principles put forth by Dr. Montessori are utilized in all classrooms - toddler, primary and elementary. Each of the teachers in these classes uses their training to create environments that cater to the characteristics of the children in their classrooms. encourages children to create themselves through exploration. provides children with the tools that they need to achieve independence. fosters love for learning by nurturing sparks of curiosity, creativity, and intelligence. encourages children to develop the skills that they need to become contributing members of the larger society. Our hope is to provide an opportunity to each student that will lead to their better understanding of the world and the roles that they play in it. The Upper Elementary class serves as a transition from the MIS environment to the world of high school. Adolescents in this class have the opportunity to develop independence, study skills, discipline; and to strengthen their academic abilities. All of the sensorial and reasoning exploration that takes place in the primary and elementary environments leads to abstraction of concepts in the Upper Elementary class. Continued enjoyment for the learning process is fostered at every level. Home | News and Events | Programs | About MIS | About Montessori | Enroll || © Montessori International School.